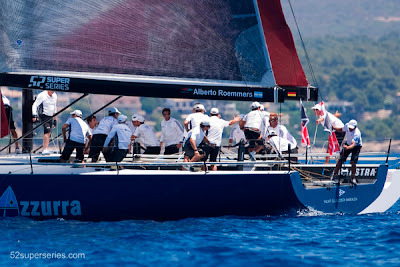 The overall lead of the Copa del Rey IRC 1 division hangs in the hands of the International Jury on Thursday, after a collision between longstanding regatta leaders Audi Azzurra and provisional leaders Audi All4One resulted in counter protests. The pair protested each other after their boats collided during an incident that relates to buoy room during a crucial race on day four of the six-day regatta at Palma, Mallorca. The pair was neck-and-neck on the approach to the mark when All4One narrowly passed on the inside of Azzurra and their yachts collided. The Italian/Argentinean team paid a penance, a 720 turn, and dropped from first to fifth. At the race’s end each team notified race management of their intention to protest the other. The protest will be heard by the International Jury at the Real Club de Náutico later tonight.The outcome could cause a major shakeup of the overall leaderboard on what was otherwise a victorious day for Audi All4One. The team scored back-to-back wins thanks to the powerhouse partnership of America’s Cup and Olympic gold medallists Jochen Schüemann and Jordi Calafat, who proved invincible. It is the third line honours win in two days for the on-form team, having won Wednesday’s coastal race. The trifecta of victories provisionally moves the team to the top of the overall leaderboard on 19 points, edging them to a three point lead over longstanding leaders Audi Azzurra Racing Team with just two-days racing remaining. But, with a protest pending and more racing to come All4One strategist Pascal Rambeau said it was too early to take too much confidence from the victories. It should have been a day of celebration for Azzurra, as July 19 marks the 30thanniversary of the launch of the first Azzurra yacht. Instead the team were commiserating their worst results yet, sixth and fifth on corrected time. The bad form could see Azzurra lose the lead they have held for two-days and slip from a 5.5 point lead, to three point deficit in second place. Provisionally Audi Sailing Team powered by All4One are the Copa del Rey IRC 1 leaders on 19 points, followed by Audi Azzurra Sailing Team on 22, Gladiator, 24.5, PowerPlay, 27.5 and Paprec Recyclage, 29. More than 1,100 sailors are competing on board about 119 yachts, across seven divisions in the 31st Copa del Rey. A maximum of 12 races will be contested across the six-day regatta that concludes on Saturday July 21. Copa del Rey does not count towards the overall 52 Super Series.